For Asia's top influencer hotspots - welcome to Sri Lanka! Still a relatively unexplored island, Sri Lanka makes for a tranquil yet exciting adventure, where you can get to grips with nature and uncover the beauty of ancient history. A destination of golden sands and rolling mountain ranges, Sri Lanka’s landscape is as diverse as it is beautiful. From tropical rainforests to enchanting Buddhist temples, this is a nation with something to excite even the most jaded of traveller. With so many places to visit during your trip, finding the trendiest spots to add to your bucket list may sound like a complex task. Well, with the help of some popular social media faces, we are here to guide you through the top influencer hotspots in Sri Lanka that will make you book your flights. Pack your bags, ready your camera and dive into the most beautiful Sri Lanka spots visited by influencers. Of all the influencer hotspots in Sri Lanka, this is one of the most profound. The ancient fortress of Sigiriya Rock is known as the eighth wonder of the world and one look at this majestic hilltop palace explains why! Sigiriya finds itself between the towns of Dambulla and Habarane and was created from volcanic magma before acting as a local monastery up until the 5th century BC. King Kasyapa transformed the rock into a royal palace which has quickly become one of the trendiest spots on the whole island. On your approach, you’ll be greeted by giant lion’s paws carved into the rock itself. Sandwiched between them are hundreds of steps leading to the top where panoramic vistas make the perfect spot for an Instagram-worthy snap! Explore the ruins of the palace before taking a scenic walk around Sigiriya’s extensive gardens – only then will you know exactly why this place is one of the top things to do in Sri Lanka. Sirigiya’s nearest train station is Habarana, approximately nine miles away. Trains travel here from Colombo irregularly throughout the day and tickets cost as little as LKR 480. Sigiriya is also connected to Dambulla by bus, running at 30-minute intervals for LKR 45. If you’re looking for social media-worthy Sri Lanka spots visited by influencers, then Polonnaruwa should be near the top of your list. The site of the noble rule some 800 years ago, this magnificent town boasts centuries of ancient history as well as some of Sri Lanka’s most important landmarks. The town is Sri Lanka’s second most ancient kingdom and its archaeological park is awash with temples. The Sacred Quadrangle, pictured here, is a colossal Buddhist landmark where serenity and history collide. Hire bicycles and explore the town like a local, because its tranquillity and its untouched beauty make Polonnaruwa one of the trendiest things to do in Sri Lanka. Before you head off from Colombo, make sure you indulge in true luxury by staying at one of our hand-picked luxury villas. Polonnaruwa is just over 130 miles away from Colombo. Take the train to Trincomalee from Colombo Fort station, changing for Polonnaruwa at Gal Oya. Intercity buses also run between the two, departing from Colombo Fort. The journey takes between six and eight hours and costs around LKR 250. The tea plantations of Nuwara Eliya have to be one of the top things to do in Sri Lanka. A mesmerising surrounding landscape makes this a destination for true tranquillity. Immerse yourself in local culture on a picturesque tour of the estate, where you can meet locals who have worked on the plantation for decades, before picking your own leaves. The main thing that draws influencers to this hotspot is the idea of sitting down with a fresh cup of tea, accompanied by unrivalled panoramic views! Plus, the train journey from Colombo happens to be one of the most spectacular routes in the world. If you’re looking for more excuses to book your trip, check out our top 10 reasons to add Sri Lanka to your travel list. From Colombo catch the Badulla train Udarata Menike to Nanu Oya then the local 715 bus to Nuwara Eliya, costing around LKR 25 per person. If you’re in Kandy, you can take a taxi to Nuwara Eliya for around LKR 6,647 (roughly $40) and the journey takes about one hour and 20 minutes. Visiting Unawatuna is definitely one of the top things to do in Sri Lanka. This key influencer hotspot, captured here by @TravelPlusStyle, lies close to the dedicated Unesco World Heritage Site of Galle, a breathtaking coastal city where Dutch-colonial architecture meets the Indian Ocean. 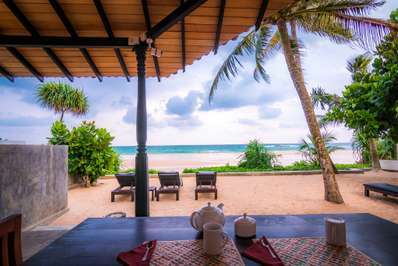 A destination of stripped-back beauty, the sands at Unawatuna are seemingly endless, with a lively yet mature night-life scene. Yet it is the beach’s acclaimed sunsets that make an evening at Unawatuna one of the trendiest things to do in Sri Lanka. Nearby Galle is also well worth exploring. This city has a uniquely European vibe, with palm-lined boulevards, artisan boutiques and bespoke cafés. Head to the city’s ancient Fort, uncover history at one of its many museums or browse for trinkets in the independent shops found off the waterfront. 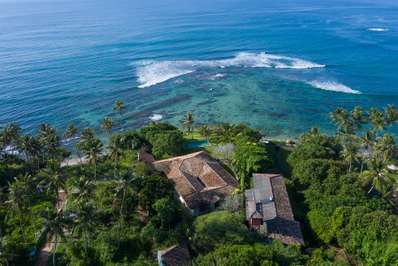 Make the most of your visit by staying in one of our impressive villas, with easy reach of Galle’s beautiful beaches. You can also take a look at Sri Lanka’s other incredible beaches, thanks to our definitive guide. Make your way to Galle train station and either take a tuk-tuk for around LKR 400 or a local bus for just LKR 21. If you want to head off the beaten track while ticking off Sri Lanka spots visited by influencers, then make your way to The Madu. A river cruise along the Ganga through the Madu lagoon is one of the best ways to experience the real heart of Sri Lanka. This idyllic waterway offers travellers the opportunity to experience an authentic river safari, making it one of the top things to do in Sri Lanka. Take a boat through this majestic landscape to witness regional wildlife, including lizards and birds of paradise. Stop off at the Kothduwa Temple and meet water-side locals, hand-making local crafts for you to purchase. The nearest bus station to The Madu is Uragasmanhandiya. From there, you can take a local taxi or tuk-tuk to the mouth of the river, approximately a seven-minute journey. From Galle, you can drive the 40 minutes to The Madu, or from Colombo you can take a train and a taxi, which should take less than two hours. ⠀ Shoutout: @ouradventureatlas! Thanks for tagging and being part of TeamSalty . Tag your posts with TeamSalty and get the next shoutout! The definitive spot for an amazing Instagram selfie, the Nine Arches Bridge in Ella is one of trendiest things to do in Sri Lanka. Located on the journey between Ella and Demodara, this impressive colonial-era railway line cuts through an enthralling green landscape. The bridge was commissioned by the British Government in 1921 and is one belonging to list of the most Instagrammed spots in Sri Lanka. Arrive in the centre of Ella and take a truly unforgettable walk along the railway line to the bridge, passing flowing waterfalls, renowned hiking routes and incredible hillside views. You can find out more about Sri Lanka’s beautiful natural spots by checking out our dedicated guide. One of the most popular Sri Lanka spots visited by influencers is also one of the most beautiful and exciting. Yala National Park is not only a stunning natural landscape, but a trip here gives you the opportunity to experience Sri Lanka’s native wildlife up close. From elephants to leopard encounters to the ancient Buddhist monastery of Sithulpawwa, this beautiful park has to be seen to be believed. Covering 1268 square kilometres, visitors to Yala National Park can enjoy bird watching, romantic beach walks and energetic hikes, as well as organised safaris through natural animal habitats. Yala is accessible from most of Sri Lanka’s main cities, including Colombo and Kandy. It is recommended to take a guided tour of Yala from the town of Tissamaharama, which can be reached by direct buses from Tangalle, Matara and Galle. A half day guided your costs approximately LKR 4500. One of the most beguiling Sri Lanka spots visited by influencers happens to be one of the most picturesque landscapes in the world. Knuckles Mountain Range, so-called thanks to its fist-like formation, offers you the opportunity to become fully immersed in nature. During your trip to this iconic mountain, you may find that you don’t meet another soul, trekking through lush green forests with only wildlife for company. Mini World’s End, pictured here, is the perfect spot for a brave photo shoot! Being one of the trendiest things to do in Sri Lanka, it allows its visitors to enjoy hilltop picnics, meander past waterfalls and fill their cameras with jealousy-inducing snaps! 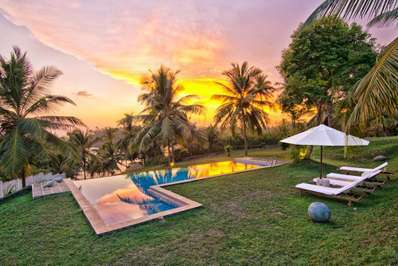 Don’t forget to make the most of your trip with a night at one of our nearby luxurious villas and apartments. Knuckles Mountain Range is situated around one hour and 40 minutes from Kandy and can be accessed by a bus from Kandy Station to Mahiyangana. Get off at Hunasgiriya and then take a tuk-tuk to the Knuckles Conservation Centre. Previous articleLow Season in Bali: Is it Worth Going?